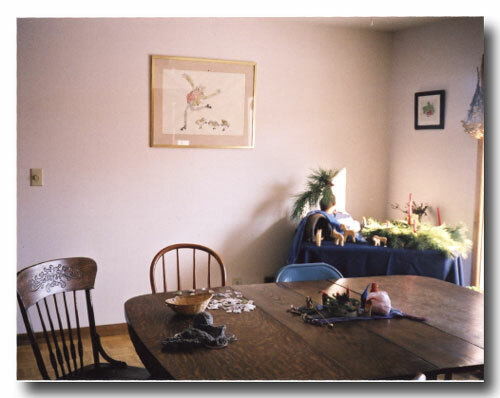 An important part of the ‘Waldorf home’ is the Nature Table. The Nature Table can be very simple or quite elaborate – the important thing is that it reflects the changing seasons outside. Our first sample Nature Table is a very simple one from Genevieve in California. 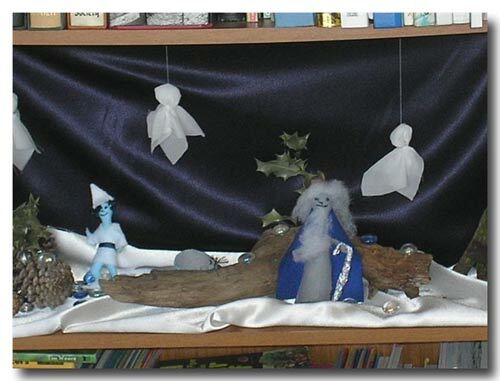 Here is our own Advent nature table from several years ago. 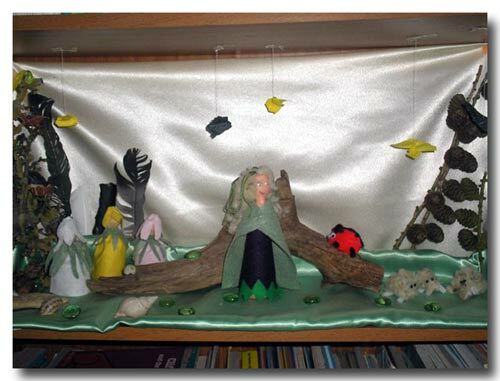 You can tell that it is the 3rd week of Advent because if you look closely (remember, click on the image for an enlarged view) you can see that the animals have arrived (following the minerals and plants) but no human beings yet! 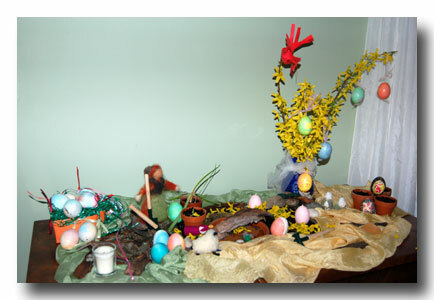 This is our nature table for Spring. 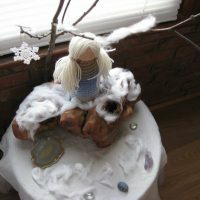 This is our first nature table as we are new both to Waldorf concepts and to homeschooling. Willow is 5.5 and Rhowan is 3.5. 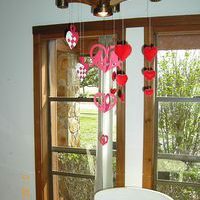 I started out by asking the kids to think of colors for Spring. We came up with yellow/gold for the sun and green for everything that is starting to grow. 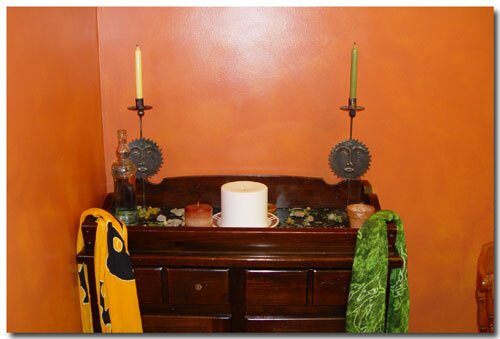 So we found fabric in those colors around the house and bought some colored candles. Then I asked them to look for items outside for spring. They brought in yellow dandelions and green leaves which we scattered around the table. They also added some rocks. Next I asked them to find items for each of the elements. 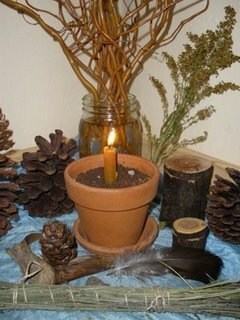 They found milkweed seeds for air, a candle for fire, a container of water for water, and some dirt for earth. 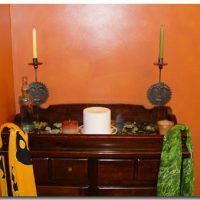 Then we added a big candle in the middle to represent the Spirit (we chose to incorporate some spiritual aspects into our nature table). 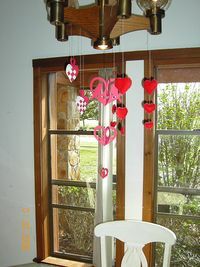 The table itself is an old dry sink that I used for a changing table when the kids were babies. It has drawers and cabinets in the bottom that we use to store all our craft supplies and whatnot. 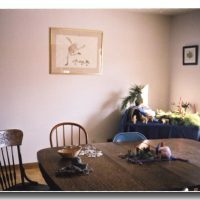 We plan to add some artwork to our nature table in the future. 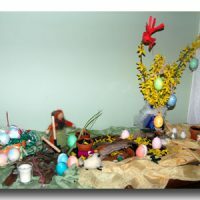 We have great fun through each season making things to add to the table and collecting interesting finds on our walks to add to our corner. 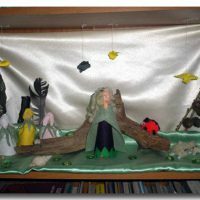 We spend a great deal of time outdoors and going for long walks with our dog and we keep our Nature corner closely related to our own environment. 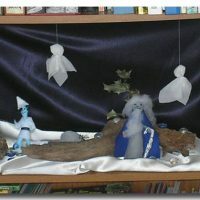 In Winter, we made a Father Winter doll, a Jack Frost doll, snow fairies. We added various cones, moss covered bark, stones and bare twigs, etc. 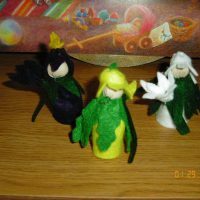 In Spring we made a Lady Spring doll, flower fairies. We had twigs with buds with little birds nests, little birds, lots of feathers, little sheep made from sheep wool we gathered on our walks, pines cones, snail shells, ladybirds. DS (3 and a half) is very involved in deciding what we will add and he is very proud of our combined efforts in adding to our corner throughout the seasons. When the season’s change, I find songs and poems about the shift in seasons and we sing these, act these out and generally have fun with them. We have recurring themes – the ‘landscape’ is always the same although we change the fabric backdrops according to the season. 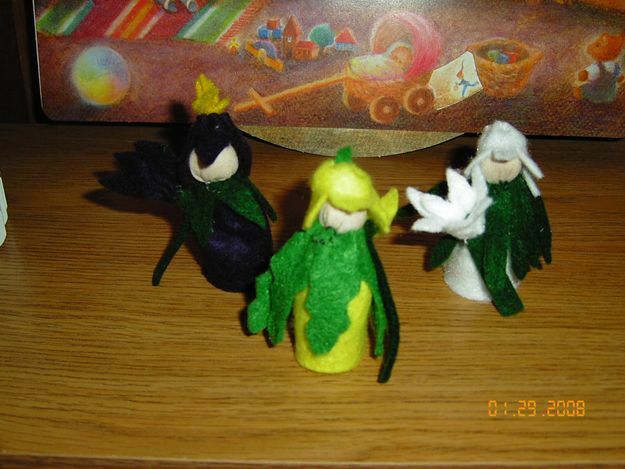 We also personify the seasons and make little dolls. 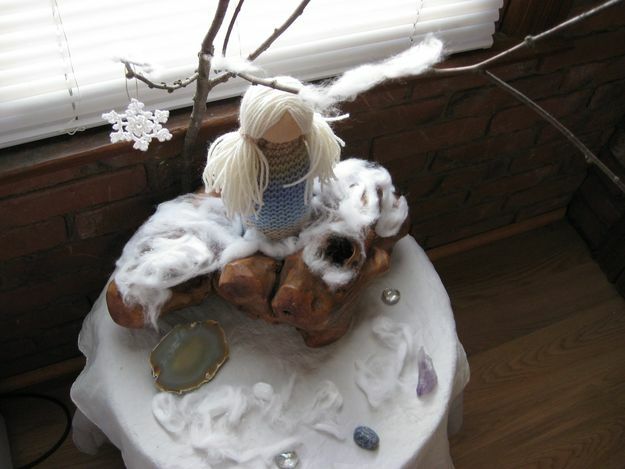 We discuss what each seasonal doll should look like. I am not very good at handwork but I’m learning all the time! 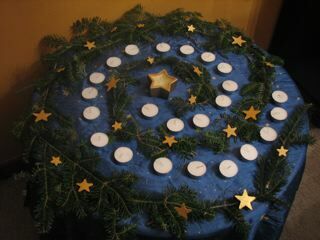 During Advent, we light a candle each evening to mark the path to Christmas day. 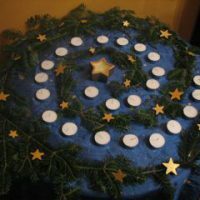 We use a night sky play silk over a small round table and spiral 24 tea light candles towards one golden star candle in the center ( representing Christmas Day) We also decorate the spiral with pine branches and little wooden stars ( that we have painted golden.) 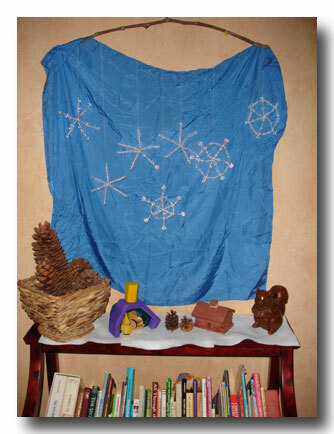 Each Sunday during the Advent we add a representation of each kingdom to the spiral. I sing “One Star Shone” from Sing a Song of Seasons by Mary Thienes-Schunemann each and every night after we light the candle. I love this time of year! 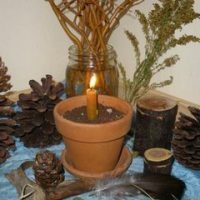 We observed Candlemas by tidying up all the pine boughs that blew into the yard from our trees, picking out our seeds for our garden,and we also “plant” our own intentions (what we want to do, change, accomplish) in a clay pot with soil, light a candle in the pot and share our intentions with each other. Then we will add this soil to our garden when we do plant our seeds so that our intentions “grow as well”. We also lit a fire in the fireplace using our fire starters that we made the week before ( for our”Shingebiss” story). They worked GREAT!